"God, in your grace, transform the world!" 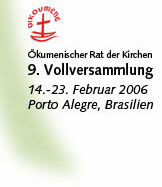 This intercession forms the theme for the 9th Assembly of the World Council of Churches, to be held in February 2006 at Porto Alegre, Brazil. In the series of quotations that follow, members of the WCC's central committee, and in particular its assembly planning committee, report on the thinking behind the choice of this theme. In addition, members of the WCC staff contribute passages from Bible studies on the theme. The full texts of the committee members' comments and the Bible studies have been published in the July 2004 issue of the WCC journal Ecumenical Review. The guiding light for us all is the assembly theme "God, in your grace transform the world." I've been invited to say whatever I like and how I like about the theme and the assembly. I don't pretend to be able to do more than share some of my personal reflections, and questions, which will carry no more weight than your own. We have done a very dangerous thing in choosing as the theme for the Porto Alegre assembly "God, in your grace, transform the world"... We are actually calling on God, in God's grace, to transform the world - the oikoumene, "the whole known world", all things. This includes us and all that we hold to be self-evident. To speak of the transforming grace of God in Latin America and the Caribbean is a powerful challenge. We cannot be agents to lull our people to sleep; we cannot be agents to close people's eyes to the problems afflicting them. On the contrary, we are agents to summon all people everywhere to make the world a better place and ourselves to work for it motivated by our Christian concept of justice. I am neither a minister nor a theologian. But as a laywoman in the Anglican Church of Canada, I have been conducting a survey to see how Canadian church members respond to the assemble theme, "God, in your grace, transform the world"
As we approach the next WCC assembly in Porto Alegre, Brazil, under the theme "God, in your Grace transform the world", the Christian churches will once again be invited to reflect, react and respond to the theme. The reflections in this article are a contribution from a theological point of view, from an Orthodox perspective. Transformation underlies our belief in Jesus Christ the Lord, the giver of life, the second person of the undivided Trinity. He was crucified and has risen, and he will raise things that were made through him. Our faith relies not only on the belief of going from non-existence to existence but also on the power of fundamental change - descending from heaven to earth, rising from death to life. Early on, the theme of "grace" emerged. We were informed that the Latin American Theological Commission, a broadly based consortium of organizations, had recently initiated a process of theological reflection "on the central theme of the grace of God, which is of increasing concern to the churches"; it was suggested that some such focus might provide promising possibilities for our own deliberations.